When I was growing up, I didn't really want for many things. My family made sure I had pretty much everything I wanted (within reason, of course). But there were still a few fashion and beauty products I never had, for whatever reason, and I'd be lying if I said I wasn't a little wistful. Behold, the 5 fashion and beauty products I wish I had. The ability to create your own designer outfits, complete with crayons and plates of different silhouettes and textures. Can you say awesome? I always wanted to try these, and maybe I just never said I wanted them, since I'm pretty sure I would have gotten them as a present. But my (always) fashion obsessed self would have gone CRAZY designing different looks with these. It was sort of like the opportunity to create your own paper dolls! Oh, to be a girl in the 80s with crimped hair. I never had one of these, mainly because my family really didn't use hot tools. (Oh, how times have changed.) I basically did my own version of crimping by sleeping on multiple soaking wet braids, but if I'd had this baby? My tresses would have been crimped to perfection EVERY. SINGLE. DAY. I just thought those super tight waves were oh so cool. Is it wrong that I sort of want to do it now, since I never had the opportunity as a kid? Let's be honest ... what child of the 80s DIDN'T want the chance to cover her clothing with jewels and studs? I sure did. I think my mom was worried I would ruin all of my clothes if I had one (which, let's face it, I probably would have). But oh, how I wish I could have bedazzled JUST ONE SHIRT. I would have felt SOOOOOO cool. Sun-In always represented cool California girls to me. I longed for the lazy days and hot summer nights that this product seemed to promise. Alas, as my hair was very dark brown, I never actually used it (although I wasn't ever told I couldn't) -- I just thought it might destroy my hair or turn it orange. I guess the time has passed to try it, but I'm not gonna lie ... if someone gave it to me for my next beach vacation, I'd use it. A game about SHOPPING?!? Are you kidding me? I should have bought this with my babysitting money, but I never did. I did, however, go over to my friend Jen's house and play it every chance I got. This game was SO ahead of its time -- it actually talked to you! I just loved going to the different stores and pretending to spend money on fashion. It was a good way to prepare for my lifetime love of shopping, that's for sure. 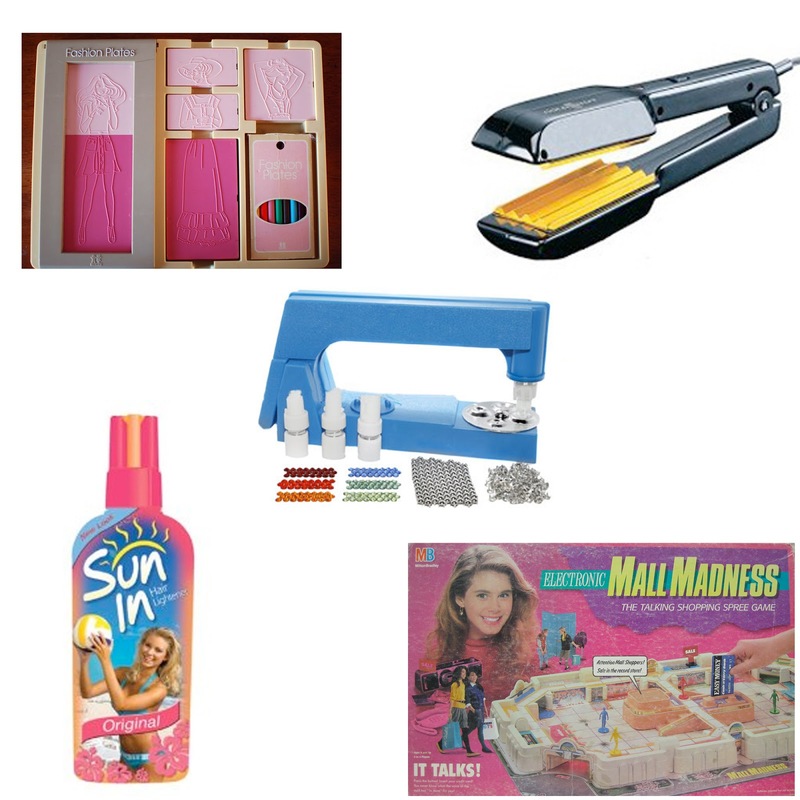 Are there any fashion or beauty products that you feel you missed out on during your childhood? Let me know in the comments! Oh I loved my fashion plates! I wanted a Bedazzler though. I rocked crimped hair! Oh man. I totally did sun in back in the day... and it definitely brassified my hair but back then, I thought it was amazing. Haha! OMG! Fashion plates! I LOVED my set! :) I always wanted a crimper (and still not-so-secretly do). OMG I HAD FASHION PLATES! I LOVED THAT! This is the best post ever! I miss my Fashion Plates! I love your list! The wistfulness of every 80s girl! I tried Sun In and my hair, which is also dark brown, turned as orange as a pumpkin.